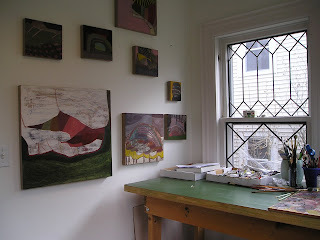 I am working on 9 different paintings that will be the last paintings I work on in this studio. I am moving from Syracuse, NY to the Concord, NH area in June. The way I work is very close to the way a person writes in a diary. My plan is, hopefully, to finish most of these and the unfinished work will bridge my current and soon to be past Syracuse life with something unknown and new. On a recent trip to NJ (where I am from) I came up with some titles, I love it when titles come so easily you just know they are right. My studio is in my home. I love it that way. I basically wake up and take care of the kids. If they are at school I can paint, if they are home due to snow days, sick days, vacation, etc., then I just paint in the evening hours. I work on about 3-4 paintings at once, but if one is going really well I'll stick with it for a few hours. I hang work in progress all around the house when I can't get as much done, this way I can at least be looking at them. 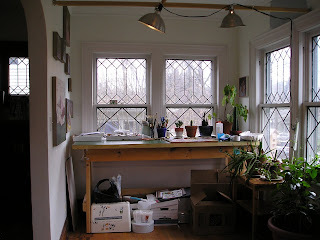 My studio space is currently a front room in our house with lots of windows with leaded glass. It has great light, but it’s small. I share it with my kids because my daughter loves to draw as well. In New Hampshire I will have more room. 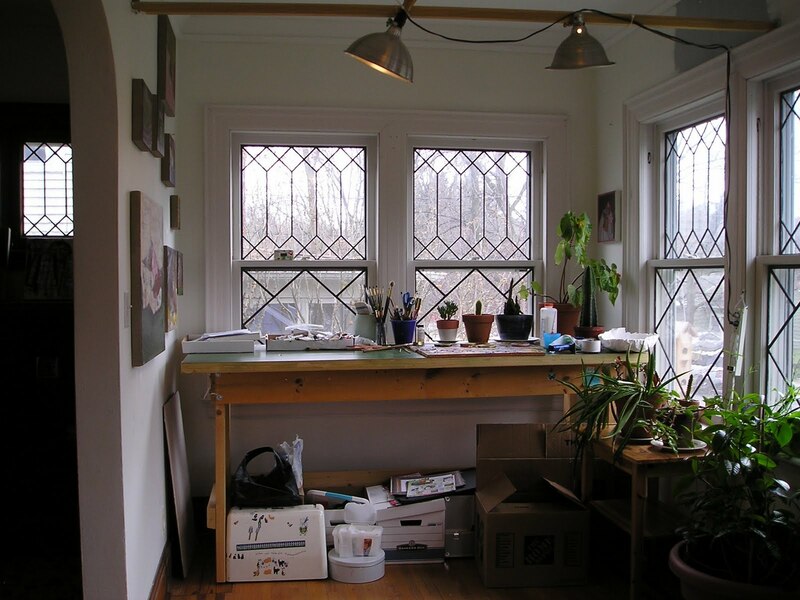 We will be renting a house at first, but the rental house has an extra room that is great for a studio. This could change my work in a good way. I will be less cramped. This latest body of work has me wanting more space. I want to make bigger paintings and smaller paintings and I can just step back further from them. I take what life gives me when it comes to art making, and the time and space allowed for it. One of my strengths is working in any situation. For instance, this summer I will be driving the kids to a 3 hour camp 5 days a week for 3 weeks in a row, it’s a 25 minute drive from my house so I decided instead of losing work time in the car I am going to park in Manchester, NH and paint from the back of my Subaru, only in small 8 by 9 panels. This way I get the maximum amount of studio time and I save some gas. I hope it works out. The first few layers of paint often get put on and wiped off until I find something I'm comfortable with. I will draw in some lines with oil paint and often they will stay. I start adding thicker layers. There’s so much editing that goes on with some paintings, and very little with others. Every painting is different and I like it that way. Some start a certain way and stay on the same path, others get completely derailed over and over (for the better), almost not making it, and then somehow I find a way to end it and even title it. 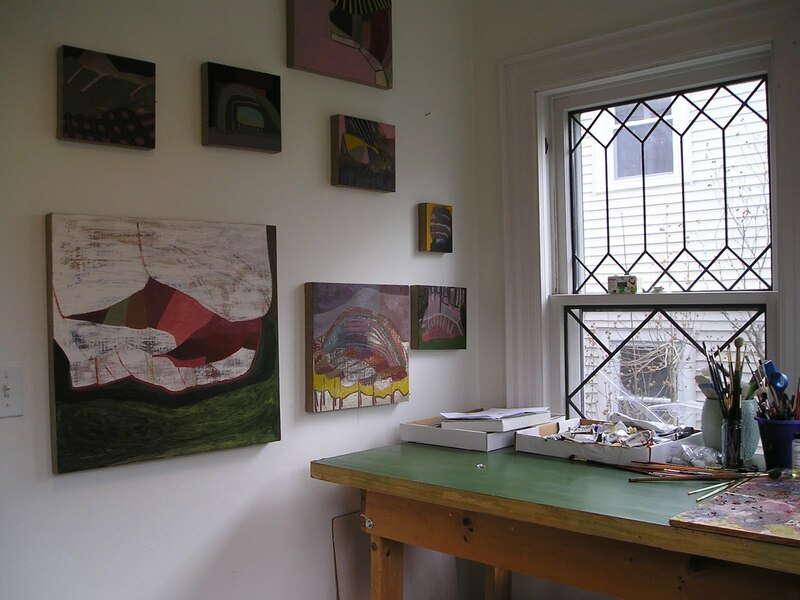 At the moment, that I'm going to be excited to paint in NH and when I arrive in the summer, my kids will be out of school. There will be lots of trips to the ocean and other directions, and then how I will paint at night. For years I experimented with everything from wax, rubber, latex, cloth, and way too much galkyd. 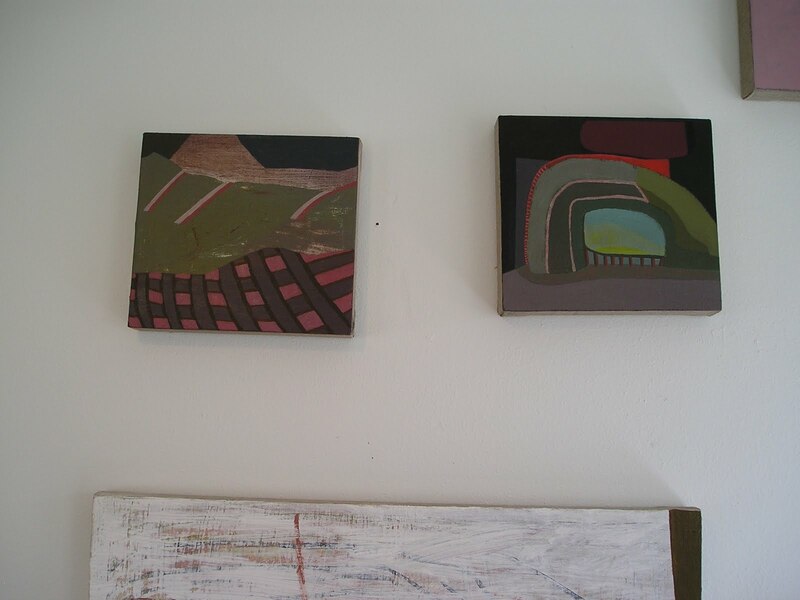 In 2009 I stopped using additional materials with my paint, and I stopped using galkyd because I was using so much with my oil paint that it was very runny. Some paintings have wax as well, but it just run its course with me, and I lost interest. I longed to just smell oil paint again like I did in grad school. I now only use oil paint and linseed oil. As far as upcoming shows, this summer I will have 4 paintings in a group show at the Geoffrey Young Gallery in Great Barrington, MA. The show is titled "Grey" and it opens July 30. Thank you Studio Critical for the interview and all of the other wonderful interviews on here, they have been great to read. Lucy Mink's work is really beautiful, love this interview aswell, shows someone jungling a life and working at the same time, with optimism. Nice work. Love it... especially "Makeshift" and "You are all allowed...". 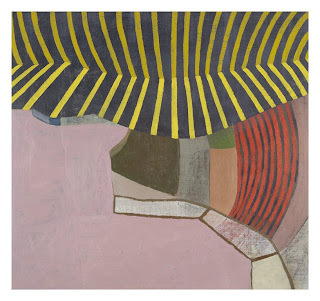 Lucy's work is a new discovery for me. I am simply a big fan. 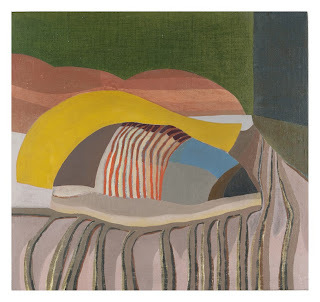 She is in touch with a natural instinct for color and the shapes and spaces she develops. There is nothing forced or contrived about her work.